Remember that bedtime story about the ugly duckling who became a swan? The image of a princess sleeping on a ton of mattresses... and a pea? The Fairy Tale about a mermaid who sold her voice to a sorceress to try to win the love of a human prince? Meet the Danish author of all the saddest and sweetest of the fairy tales we all grew up with, tales seen referenced in pop culture so frequently that many people have no idea they were written by the same author. 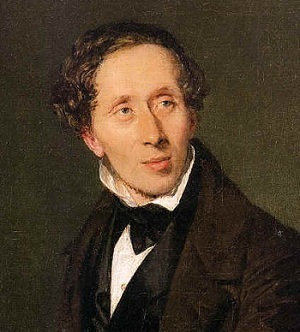 Born on April 2, 1805 (which is now "National Children's Book Day"), Hans Christian Andersen (abbreviated H. C. Andersen in Denmark) grew up to become to fairy tales what Shakespeare became to drama. His works range from the simple to the epic, are full of complex but meaningful symbolism, and span the Sliding Scale of Idealism vs. Cynicism. The most familiar version of "The Little Mermaid" in the western world is probably Disney's, which deviates strongly from the original: Hans Christian's protagonist has No Name Given, no bikini top made from seashells, and no Non Human Sidekicks, but does have a grandmother, and wants to marry the prince for "an immortal soul" (yes, in the Christian sense) as much as for romantic love. Not to mention the minor fact that said prince marries another girl, meaning she'll die unless she stabs him, which she doesn't. And then there's a bit of disconnected Deus ex Machina Aesoptinum Mood Whiplash, but we don't talk about that. Interestingly, Oscar Wilde still thought the story too upbeat and penned an even darker version, "The Fisherman and His Soul" as a reaction. In this charming tale a human must sell his immortal soul in order to marry a mermaid. Other works have come through the adaptation process about as reasonably intact as can be expected. "The Snow Queen", basically an epic Gender Flipped Rescue Romance heavy on the symbolism, has been turned into a science-fiction novel, an animated movie, and an anime by NHK, Cardcaptor Sakura's network. The Disney film Frozen was originally meant to be an adaptation of "The Snow Queen", and even had it as its Working Title (and it's still titled that in some countries), but ended up developing into its own original story with inspiration from the fairy tale. The Other Wiki says he was also quite possibly bisexual, so that's fun too. It's also noted that Andersen himself, his eccentric behavior and arrogance usually led to him getting kicked out by the various nobles who housed him. An important point in the tale "Something", where a caustic critic is "something" because he does that constantly. The Snail in "The Snail and the Rosebush". The Devil in "The Philosopher's Stone". An Aesop: Often a Space Whale Aesop as in "The Rose Elf" (don't kill your sister's beloved, or the spirits that live inside the blossoms will murder you in your sleep). Animate Inanimate Object: The shoes in "The Red Shoes" not only compel the poor heroine into an Involuntary Dance, they dance off with her severed feet after she has them amputated. Be Careful What You Wish For: In his story, "The Galoshes of Fortune", the eponymous shoes grant the wishes of whoever is wearing them. This usually ends badly, as the characters are unaware of their power. Beauty Equals Goodness: More than one of his characters ponder this, with truth as the third platonic entity in the mix. The Philosopher's stone plays it straight. Bowdlerise: When companies adapt his works, most writers attempt to remove the Died Happily Ever After trope with varying results. Cranky Neighbor: A mild variety, mostly on the subject of Denmark and Norway. Mostly in "The Rags", where the two nationalities lash out towards eachother, with an ironic twist. Also in The Elf Mound, where the Norwegian Troll King is trying to get a bride from the more Danish fairy stock. She finds the Norwegian trolls rude. Creator Breakdown: invoked Rumors abound that several of Andersen's works are a result of dealing with his own romantic and sexual issues. The Nightingale was allegedly a tribute to a singer known as "The Swedish Nightingale", Jenny Lind, who did not reciprocate Andersen's romantic feelings. "The Little Mermaid" was a similar case, of Andersen dealing with 'losing' a close friend (one he had feelings for) to marriage. Died Happily Ever After: Dying horribly (which appears to be intended as happily) and going to Heaven seems to be Andersen's idea of the ultimate Happy Ending. Averted, however in "The Nightingale", which has a regular Happy Ending: the protagonist, thought to be already dead by everyone, survives after all. Disobey This Message: The fairy in "The Garden of Paradise" tells the prince that she is bound to beckon to him and to say "Follow me". As she is a Forbidden Fruit, the prince needs to disobey that instruction. Disneyfication: A lot of his works has been adapted into animated features for kids, most of them naturally being done by Disney. Thumbelina also fell into this, despite being done by Don Bluth. "The Storks". A young boy leads several other boys into singing a song that taunts a family of storks. As revenge, the storks refuse to bring any of the boys baby brothers or sisters... except for the boy who led the song. The storks bring him a dead baby brother. "In the Duck Yard". An injured songbird is resting in a duck yard, where a proud and haughty Portuguese duck resides. The songbird makes the mistake of comparing the Portuguese to a cat, so the duck decapitates the songbird. The Red Shoes, in which the protagonist is punished for paying more attention to the title objects than to her family or to church sermons by being forced to dance in them until she dies. Oh, and the shoes keep on dancing, even after her feet get chopped off! Family-Unfriendly Violence: Most obviously in "The Red Shoes," where the heroine has her feet chopped off because her cursed shoes won't come off and won't stop dancing. Forbidden Fruit: The fairy in "The Garden of Paradise". Should she be kissed, the garden will be ruined. Gossip Evolution: "It's Perfectly True" shows how the true story evolves into so many different versions with every teller still insisting, it's Perfectly True. Hope Spot: Many tales come out as this. The small tale has a happy ending, but the big picture is always a different matter. Incorruptible Pure Pureness: Eliza in "The Wild Swans" is so sweet that she can turn cursed toads into beautiful red poppies. Irony: In "Red Shoes", all the protagonist wanted to do was dance. This was literally all she could do. Kick the Dog: Inge, "The Girl Who Trod on the Loaf", is first introduced as a child tormenting insects. Mouse World: "Thumbelina" features one, with the tiny protagonist having adventures among the small creatures of the forest. Mutual Envy: In "The Goloshes of Fortune", the titular goloshes cause wishes to come true (although no one who wears them is aware of this property). A watchman puts them on and, looking up into a lieutenant's window, wishes he was the lieutenant. He enters the consciousness of the lieutenant — and the lieutenant, looking down enviously, wishes he was the watchman, which restores the watchman to himself. Nameless Narrative: Many of his stories don't name the characters and merely refer to them by their titles, e.g. 'the mermaid' and 'the prince' in "The Little Mermaid." Nature Is Not Nice: "A drop of water" is about a scientist who looks at a drop of water in a magnifying glass and is horrified to find it full of tiny Eldritch Abomination like creatures tearing each other apart. Pride: A common Fatal Flaw. Vain characters, or characters who refuse to humble themselves, often get humbled by circumstance. The Sandman: The fairytale "Ole Lukoje". Lukoje is Danish for "Shut-eye", which is the Danish name for Mr. Sandman. Satan: Features in "The Philosopher's Stone", among other works. He is prominent when Andersen discusses truth vs untruth. Satan is clearly the "prince of lies", while God is the equivalent of truth. Scare 'em Straight: Present in many of his works. The most egregious example would be "Ole-Luk-Oie". Simplified, writing a "C" (and worse) in school will get you to hell after death. Yes, a "C". Sliding Scale of Idealism vs. Cynicism: As the writer of so many beloved fairy tales, his works fall right off the idealistic end of the scale. Spared by the Adaptation: Many modern adaptations of "The Red Shoes" have Karen finding a less painful way of removing the title Clingy MacGuffin, and the story ends with her still alive. Swan Boats: In the fairy tale "Ole-Luk-Oie", Hjalmar dreams that he rides in a boat pulled by swans. The 1952 film Hans Christian Andersen, starring Danny Kaye, which describes itself as "a fairy tale about the great spinner of fairy tales" (a colorful way of saying it's almost entirely made up). Fate Extra CCC and Fate/Grand Order, where he is a Caster-type Servant. Contrary to fellow famous writer William Shakespeare, his appearance is that of a child but with the baritone voice of a fully-grown man, representing how he has a childish mind capable of writing his fairy tales, but still carrying all his adult life experiences. He also loves tearing down the motivations of those around him but fully capable of acknowledging their strengths as well. Swedish playwright Pär Olof Enquist wrote Andersen into his play Life Of The Earthworms. Enquist envisioned a Historical-Domain Character setting where Andersen had a closure with the Heiberg couple, actress Johanne Louise and critic Johan Ludvig.